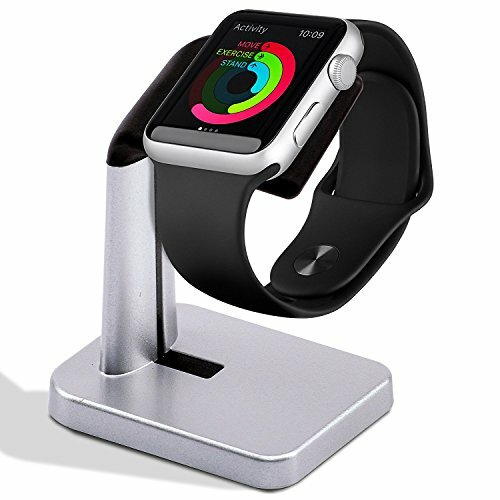 A dedicated charging stand will not only keep your Apple Watch always ready to go, but it'll also add a touch of design flair to your desk or nightstand. Aluminium stand is a solid build for better stabilization and a natural look for home or office. Soft rubber on the contact spots, protects your devices from possible damagefrom the hard stand. Sleekly designed iWatch Charging Station hides Apple watch cord (2m) inside Apple watch stand under a cover in special holder. CHARGING DOCK: High quality aluminum charging station for Apple iwatch of all types 38mm /48mm Series 3/ Series 2/ Series 1 /Series 0. You can charge your watch with open or close band. CHARGING PAD: Stylish station for your battery charger absolutely elegant and minimalist accessory. Machined aluminium block suitable for any design. Ideal watch holder for woman and for man. DESIGN: The charging disc fits easily into a rubber recess in the stand and the cable runs down a rear channel and underneath the basic's band anti-slip platform. Rubber pudding protects from any mishaps when placing and removing your watch. The footing is heavy so stand doesn't tip over. Manufacturer: Shenzhen Taiworld Technology Co., Ltd. Publisher: Shenzhen Taiworld Technology Co., Ltd. Studio: Shenzhen Taiworld Technology Co., Ltd. If you have any questions about this product by A'O, contact us by completing and submitting the form below. If you are looking for a specif part number, please include it with your message.